>As I may have mentioned several million times, I recently went red (in the head department) and keeping hold of that cover once I’ve paid a bazillion dollars* for it, is now one of my constant torments. Happily, I’ve been giving a few products a go and they’re all working out. Whee. Next time I get the roots done, I’ll do some before and after shots for you. Honest. If I remember. Anyway, first up on the block is Tigi Bedhead’s Colour Combat shampoo and conditioner. I wasn’t sure about this at first as I’ve been very much leaning towards colour depositing options but I stuck this in the shower, looked at it for a few days and then, one shiny morning, I stepped into the shower to find it smelling of the most delicious toffee-chocolate-candy goodness. Seriously, I wanted to lick the walls. And I clean our shower so I know that wouldn’t be a good idea. Turned out, my brunette-coloured roommate had popped open the Colour Combat and that was where the amazing scent was coming from. I immediately caved and washed, rinsed and repeated. It was delicious. Any no colour loss! I have to admit that I’ve still been including my colour depositing deep conditioner once a week or so but in between treatments, this is a great, great, great option. Love. My roommate also vouches for it’s wonder. The main evidence of this is that we’ve already gone through one set of the shampoo and conditioner and are currently fighting over the leave-in conditioner. We used the Colour Goddess version (kindly provided by ABPR) for redheads and brunettes but I’d love to hear from anyone who’s tried the Dumb Blonde version. 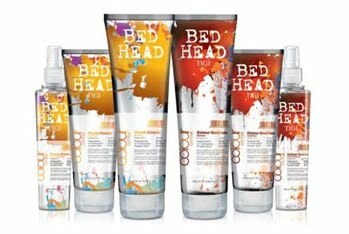 Check out the entire range at www.bedhead.com I’m also a long-term lover of After Party if you’re putting an order in. And when I had shorter hair, I lived and died by Hard to Get. Love. April Rules! What’s in the Bag? In the old days, when i used to use and abuse my hair by bleacing it, i used Dumb Blonde shampoo and reconstructor. The shampoo smelt like sweeties, always a good thing! on that alone i think people should try it… and the reconstructor basically did what it says on the label, and packed full of great sounding things like wheat, soy, keratin why wouldnt you want to slather it on? great purchase and if i was to ever go to the lighter side again it would be my must have.